Need a simple, powerful and fast resource file builder? With Resource Builder you can create, edit, compile and merge RC scripts to build new resource files (.res) fast. Only Resource Builder provides full support for Unicode resource files and resource data! Import resources from existing WIN32 executables and 32-bit/16-bit resource files (RES, DCR). Extract, update and modify any resources in 32-bit executables (EXE files) and libraries (DLL and other files). 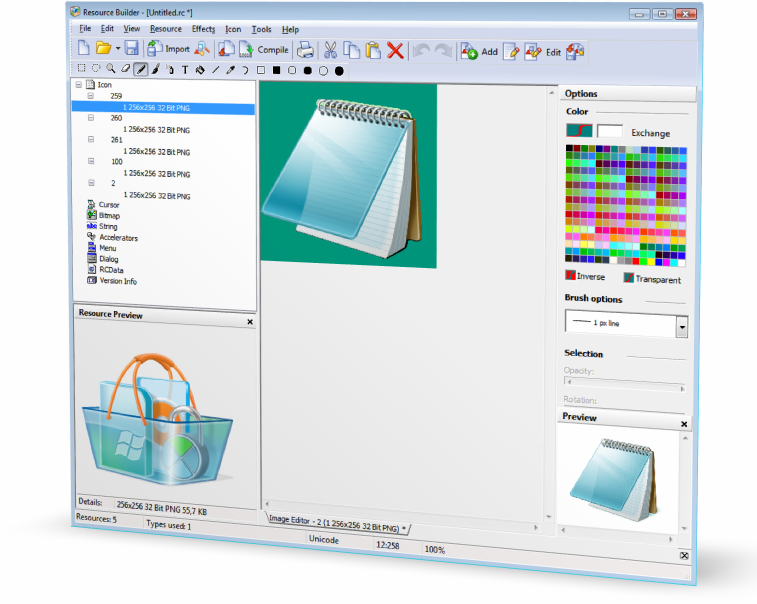 Edit images and create dialog windows with Visual Dialog Builder. Save any resource item from your RC script to a specified file. Resource Builder supports JPEGs and can perform graphics conversion to and from BMP, CUR and ICO files. You can also adjust image sizes and quality to get the results you want. Since the program supports DFM (Delphi forms), you can view and edit Delphi's and C++Builder's forms in simple text format. This feature is especially valuable because Resource Builder comes with own text editor that supports syntax highlighting and search-and-replace function. Resource Builder is very well equipped and comes with editors for bitmap, icons, cursors, string table, menu, accelerators, dialogs and version info. HTML and XML support makes Resource Builder a natural choice for any project that might involve web integration. Finally, the program also allows updating resources in existing executable modules. Plus, files can be compiled both with console or command line, which is great for bulk processing. Conveniently, files can be added by dragging and dropping or with windows clipboard. Resource Builder includes configurable mutlilanguage user interface and provides ability to add support for your own language easy and fast. If you need more information please contact the developers of Resource Builder (SiComponents), or check out their product website.